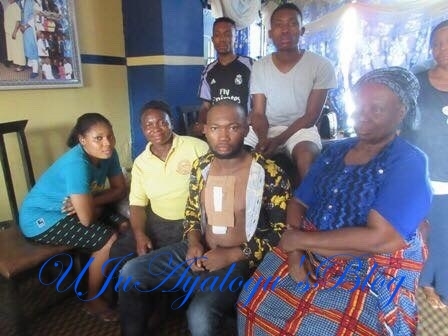 Home Nigerian News Read Full Story Of Nigerian Man Who Woke Up After Being Declared Dead, Explains What Really Happened. About four months ago, I was diagnosed of in ventricular centre defect that is a hole within the walls of my ventricle. It is a serious cardio-logical problem said to be common with infants. After several cardio-logical examinations which proved positive, the doctors said my heart was already condemned and the only solution was to go for a heart transplant. The initial minor surgery carried out to cover the holes proved abortive. So, I was asked to go for an orthopaedic heart transplant which cost 24 million naira including other expenses. There was no money. We wrote to the state government who assisted with a little sum. My church assisted me; friends and family contributed too, my surgeon Prof, Tamson, a consultant cardiologist who has worked in India for over 20 years before coming back to Nigeria took up my case because he said in over 200 cases he has done in cardiology, my case was different and rare. He spent huge sums of money on my case; he used his influence to attract many Heart Foundations to subsidise the cost of the operation. My surgeon heard me and came to bring me out from the mortuary. Coming out I discovered that my whole body was covered in formalin, a preservative used on dead bodies. At this development, my family was contacted telling them I am alive. After having a warm bath to wash off the formalin, I saw everybody dancing and rejoicing at the hospital in India, I was speechless, the only word that came out from my mouth was take me home. All through the period I was pronounced dead, all I could see were doctors on white performing a surgery on me. I ended up not having the surgery I went for, and after another round of cardiological examination, the doctors found out that there were no longer holes in my heart, everything disappeared, and that I was perfectly, okay. I kept on insisting to go home, and after my doctor in Nigeria was contacted to tell him I was perfectly okay, they took me to the airport and I boarded my flight to Lagos. People in India were rejoicing, calling my situation a miracle. “My surgeon received me in Lagos amidst tears; he was the one who told me the news of my death had circulated. In a bid to actually confirm the report of the doctors in India, he took me into the lab for examinations, and he arrived at the same conclusion. I came back to Agbor yesterday being June 14, 2017 totally okay and fine.